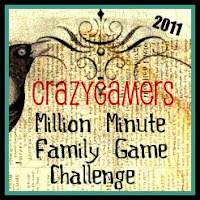 SusieQTpies Cafe: Giveaway and 2011 Million Minute Family Challenge! Giveaway and 2011 Million Minute Family Challenge! It is finally THAT time of the year, again! What time is that? It is time for the Patch Products annual Million Minute Family Game Challenge. We've been participating for a few years now and love it. Each year we get a few more friends to participate. Our team name is Crazy Gamers! So look for us. Register your group and receive a free organizer kit by mail. Gather your friends or family and play your favorite game. You can play one time or play as much as every day. Do what fits your schedule! Keep track of how long your group plays and return to this website to log your minutes. Every minute you log helps us reach our nationwide goal of one million. Play just 20 minutes a day! Schedule Family Game nights or weekly game nights with friends & family. Get your Girl Scout, school, library and church involved! I will post on this event once a week and have occasional giveaways, game reviews and more. I sure hope you join in and participate. I will post a linky so we can check up on one another during this event and find game reviews & giveaways to share. Speaking of reviews and giveaways I have one for you today (I have another giveaway set to go live tomorrow, too). 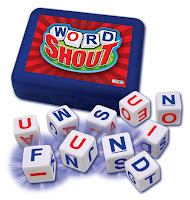 WordShout is a Patch Products game. It is a dice game for 2-4 players with the recommended age of 8 and up. I would also recommend it for 6-7 year olds if they are playing together with one adult or teacher. This will give them a chance to try and form basic, early reader words quickly! Info: You’ve got to let loose in this wild word-grabbing game! You never know what words the roll of the letter dice will make…just find them fast and shout them out to be sure you get them before anyone else! You can also get this game as an App! Check it out. I'll have a giveaway of the app in the future. Do you want more chances to win this game? Then click the below read more to enter the very easy Rafflecopter giveaway form. You can quickly gain extra entries. This giveaway will end 9/22/11 and open world wide. I'm following you on google friend connect using my artsy 14 at gmail dot com email addy. Sorry i didnt leave it above! Getting the entry on what game you cant stand playing...that would be Chess. Sorry I think it is boring! I can't stand playing Chess. Too strategic to me. Thanks...this looks like so much fun! I agree with Susan (above). I really have no time for chess. Games should be fun...and I have never found chess to be any fun. My all time favorite game is Scrabble. I can't stand playing chess, I find it neverending & boring. Thanks for stopping by my blog, commenting, and leading me to all this fun!! My fav all time game is...rummikub. My all time favorite game is Floridaopoly!!!! My sister and I used to play it at least 3x a week when we were younger. I can't stand playing Scrabble!!! Million Minute Family Challenge group name: Roman's what?! I can't stand playing Risk because I never understood it! lol. My fav game is Scrabble...I even play it online! left email addy in RC form. Luv word games, thanks for the giveaway! I don't like the card game Pinochle...I tried to learn it but just can't get the hang of it. Thanks to all who played! Come back again for more post, giveaways, etc. If you have a blog I visited you.